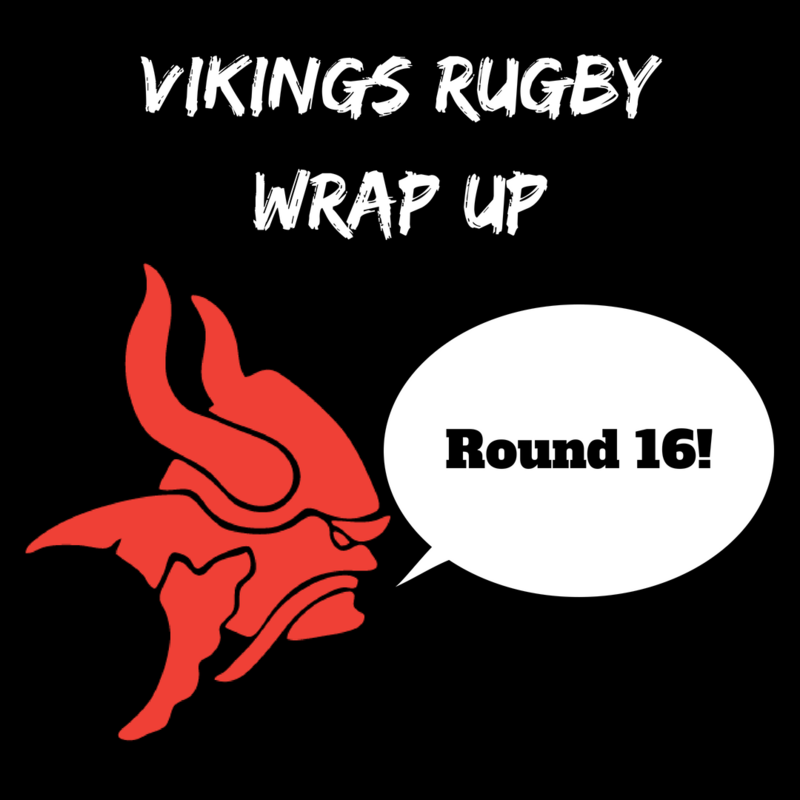 It was a quiet weekend for the Vikings with only 3rd Grade and the ViQueens taking to the field, the Premier Grades earning a Bye round and 4th Grade’s opponents, Cooma, forfeiting their match. It was a successful weekend, none the less, both teams playing some entertaining Rugby to stack up a big win each. The Thirsty Thirds took on the Cooma Red Devils at Viking Park in an early 1:30pm fixture. There were some dusty heads stumbling around the grounds, after a successful Sportsman’s Luncheon the day before, but this didn’t stop the Vikings from playing a cracking game of Rugby that had it all. The Vikings received the kick off, and within 2 phases had run 60m up field to score their first try and set the standard for the day. Joey Vejvoda and Andrew Talaina combined beautifully in the back row to gain a lot of yardage for the Vikings, busting the line and offloading to the backline to punch through the Cooma defense up the middle channel. The halves combination of Ryne Bowden and Cameron Shaw directed the play superbly to put the Vikings in excellent field position, having some nice touches with ball in hand, too. 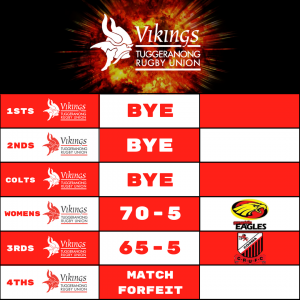 The Vikings will have to focus on some key areas heading into the Major Semi-Final, as tougher opposition won’t allow for such an easy grasp on the momentum of the game. None the less, it was an all round performance from 3rd Grade, who won comfortably, 65-5. A special mention to Tom Carney, who played his 100th Game for the Club on Saturday. Carney absolutely loves playing for the Vikings and now joins an exclusive group of players in the 100 Club. Congrats Carney, here’s to 100 more! The ViQueens were out at Griffith Oval against the Gungahlin Eagles, playing in a rescheduled match. Similarly to 3rd Grade, there were a few aching heads in the ViQueens warm up, several of the girls enjoying the Sportsman’s Luncheon festivities the day prior. The ViQueens didn’t miss a beat though, dominating play quickly as they have all year. It was the forwards who led all aspects of the game again – Tayla Stanford continued her dream year with another bruising display, joined by Michaela Leonard who touched down for a brace of tries. Remi Wilton had another outstanding game at scrumhalf, leading her pack around astutely and having some nice darts from the base of the ruck. All eyes lay on Robbie Kydd, the Club’s kicking coach heading into the finals series – after spending just over a month working with our kickers, his influence is yet to be determined, with goal kicker Emily Sogal notching 4 conversions from a possible 12. This was no harm to the ViQueens, who used their pace out wide to score try after try. ViQueens 70-5. And that’s a wrap for Round 16. This weekend, all Grades play their final Round game of the year and will be looking to cement themselves as Major Semi-Finalists the week after. The Premier Grades, 3rd Grade and the ViQueens are all out at Griffith Oval, while 4th Grade travel to Portsea Oval to play RMC. Stay tuned to our website and social media for game times!